There are lots of fun reasons to get families and friends together in the fall. From traditional holidays, such as Labor Day, Halloween and Thanksgiving; to personal occasions, such as birthdays, weddings, anniversaries and other landmarks; and even just-because type gatherings, for dinner or to celebrate the beautiful autumn season; parties of all kinds are just around the corner. Unfortunately, for Westport pet owners and pets all across the country, this time of year can also be hazardous, if you don’t know what to do. While it might seem harmless to toss a little bit of holiday food to Fido or Frisky, many of the foods that are served to humans are quite dangerous to pets. Many trips to the emergency veterinary hospital occur this time of year. Veterinary ultrasound in Dartmouth is often used to find things like turkey bones or ham bones, which can become lodged in your pet’s digestive system and cause serious damage. In addition, foods like chocolate or seasoned foods, can wreak havoc on your pet’s system or even cause toxic reactions that can lead to severe sickness or death. Even if your pet has consumed these foods before, they can still have a fatal reaction. Westport pet owners should keep the number to their local Dartmouth animal hospital handy and ask their veterinarian for information on signs of toxicity and other symptoms of dangerous food consumption. The sooner you can get emergency vet care, the better your pet’s chances if they consume something that they shouldn’t. Another thing that can be a temptation to pets are your typical seasonal decorations. 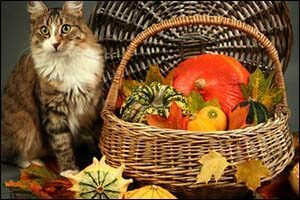 Pumpkins, gourds, wreaths, plants, bouquets, dried flowers, leaves and even silk or plastic decor, can often look appetizing to dogs and even cats, especially if left unattended. Some of the popular fall plants that are most dangerous include hydrangea, fern and Baby’s breath. You can speak with your emergency veterinary hospital about getting a complete list of toxic plants, but the truth is that you are better off keeping all plants – real or artificial – away from your pet’s reach if you are unable to supervise them. Table decorations, hanging decorations – including lights, as well as other holiday or celebration decor, should be kept out of your pet’s reach. If the decorations must be low enough where your dog or cat could get at them, make sure they are supervised or that they are kept away from the potential risks. You can keep your pets in a locked room with food, water and bedding or crate them while you prep for your party and even when guests arrive to help keep them safe. This will prevent guests from feeding your pets dangerous foods and prevent pets from bolting out the door if they get scared by all the noise. even exotic pets that are kept in cages and tanks can be at-risk during a party situation; it is best to keep them in a locked room away from party guests and exposure to noise, perfume, cooking smells, curious guests, etc. Before the holiday party season kicks into full gear, visit your local veterinarian at Anchor Animal Hospital for a full check-up or to ask advice for party planning with a pet. Westport pet owners should know that our location offers veterinary ultrasound in Dartmouth, which is instrumental in locating lodged items or foods in your pet’s digestive tract, as well as diagnosing many other holiday-related incidents or issues. Have the number to our emergency veterinary hospital handy so you can call in the case of an emergency. You can reach our Dartmouth animal hospital by calling 508-996-3731.